It’s a strong class. There will be some depth heading into day three but the best of the talent will go quickly. It’s possible all of the names above could go in the top-75 if not the first two rounds. Pro’s: Perfect modern day running back. Barkley is a swiss army knife and provides so many options. A defense has to be constantly alert to where he is on the field. Whenever he has the ball he’s a threat to score. Has the size of a power back (5-11, 228) but the skills of an Alvin Kamara. He could get Andrew Luck grades. Big, explosive, fantastic character. Amazing talent and as good as advertised. Con’s: Looks really quick on the field but it’ll be a surprise if he runs the 4.3 times he reportedly manages at Penn State. He only ran a 4.63 at the SPARQ combine. The media will over analyse his forty time but he’s more explosive than fast — and that’s more important for a RB anyway. Expect a +40 inch vertical (he topped 38 inches in High School and he’s more explosive now). Fit in Seattle: He’d be perfect but he’s going to go in the top-five if not #1 overall. So it’s not happening. Pro’s: He’s Jamaal Charles 2.0. The two players are stunningly similar and look almost identical in terms of body type, competitiveness, athleticism and playing style. Despite only being around 6-0 and 203lbs, Jones II is incredibly tough and finishes runs. He has a sensational ability to avoid pressure in the backfield, work through traffic, cut and accelerate. In the open field he’s as exciting as any player in college football. A star in the making and a legit first round talent. Con’s: You’d think he’d be great in the passing game given his skill set but he barely got involved at USC. It’s unclear why. There’s no evidence of any development in pass protection. He isn’t 225lbs so you might need to manage his workload. Fit in Seattle: In terms of drafting history under Carroll/Schneider, they’ve consistently gone after backs that are approximately 210-225lbs. Jones II is smaller but he also looks like a phenomenal talent capable of genuine stardom. Put him next to a bigger back (Chris Carson? Carlos Hyde?) and you might have your answer to Ingram & Kamara. He looks special and the Seahawks love tilt-the-room types. Pro’s: It’s easily forgotten but for two weeks Auburn looked like the team to beat in college football. They absolutely destroyed Georgia and then beat Alabama convincingly. Johnson and a ferocious defense were the reason. He’s well sized (6-0, 212) with a similar body type and playing style to Chris Carson. He’s incredibly patient in the backfield and has drawn legitimate comparisons to Le’Veon Bell. Plays with toughness, he’s an asset in the passing game and has been a workhorse for Auburn. Con’s: Johnson has a very upright running style and it’s problematic. He’s not squatty, plays tall and has been a walking target for big hits. Ronnie Harrison absolutely hammered him in the Iron Bowl and essentially prevented him from being anywhere near 100% in the SEC Championship. Does a good job falling forward but not the most elusive when backed into a corner. Fit in Seattle: Considering how high they were on Carson, it stands to reason they’ll like Johnson too. They share some striking similarities. He matches up with their size ideal, he’s carried an offense and he’s tough. Do they want another back like Carson, however? Pro’s: Incredibly tough running back who plays with a chip on his shoulder. Perfect size (5-11, 228) and capable of setting the tone. Classic north/south runner but doesn’t get enough credit for his ability to find space and make things happen. Not just an up-the-gut runner. Surprising speed when he gets going. Pre-injury he was one of the best athletes to ever test at the Nike SPARQ combine (143.91) and if he’s back to that level, watch out. He ran a 4.47 and managed a 41-inch vertical. Can force opponents to commit to defending the inside run. Con’s: The injury was career threatening and in 2016 he didn’t look quite the same player. By 2017 he regained some of the explosive physicality and hopefully he’ll keep getting stronger with time. He rushed back in 2016 and lost a significant amount of weight in recovery. Not a multi-dimensional back you want to feature in the passing game. He’ll likely need to be paired with a more versatile compadre. Fit in Seattle: They love tough, physical, gritty backs that have battled adversity. He’s a no-nonsense, 24/7 football man with a laser focus. He fits their size ideal and he’s as explosive as they like. If he’s physically back to his best and passes all the combine medical checks, he could be their guy. They also like to seek value and if Chubb drops because of the injury history, it possibly works into their favour. Pro’s: Really came on in 2017 and found a consistent role within the offense. Extremely high character and good size (5-10, 220). Plays like a much lighter runner but is bigger and sturdier than you think. Incredible footwork and balance and finds improbable ways to dodge defenders on the perimeter and break off big gains. Only needs an opening to make a long run and can be a home-run hitter. Better working outside than inside. Con’s: Despite his size, Michel isn’t a particularly impressive inside runner and isn’t likely to get many short-yardage carries. Not the passing game dynamo you might expect — he only had nine (!!!) catches for 96 yards in 2017. Ran a similar forty time to Nick Chubb at the Nike combine (4.46) but wasn’t as explosive (his 30.5 inch vertical was 10.5 inches weaker than Chubb’s). Not as elusive as you might expect. Fit in Seattle: The combine will be important. He has the size they like but they value explosive traits over speed. He’ll need to do better in the vertical jump. Is he more of a compliment than a feature runner? Pro’s: Guice runs with his hair on fire. He’s tough, leaves his mark on the field and competes. He’s difficult to bring down and builds as the game goes on. Capable of breaking off long runs and taking a high number of carries. Did a good job spotting Leonard Fournette in 2016 when he was fully healthy and at times looked like he was destined for big things. Not overly active in the passing game but showed some potential. Con’s: 2017 season was, in fairness, a disappointment. He was banged up but also showed some limitations. Guice isn’t a great athlete and his success is born out of sheer determination. Forget the spurious ‘reports’ suggesting he’s been running in the low 4.4’s. He ran a 4.61 at the Nike combine, managed an appalling 4.66 short shuttle and only a 30-inch vertical. He’s not a bad player, far from it, but he has limited physical potential. Guice had a tough upbringing and it’s something teams will spend time on. Fit in Seattle: There’ll come a point in the draft where Guice could present great value. He’s intense, physical and tough. If he drifts into the second or even the early third — the athletic limitations are less of a problem. You take him and feel happy about it. The Seahawks could love his attitude to running the ball and he’s very similar to Thomas Rawls in personality and size. He likely won’t be an explosive tester though. Pro’s: Beauty is in the eye of the beholder and some teams are going to really like what Freeman offers. Of all the running backs in this draft, he might get the broadest variety of grades. For a bigger back (5-11 ½, 234) he can really shift. If he gets an opening he can turn a good run into a great one and has shown the ability to get outside. Has the frame to be an early-down back and has been ultra-productive even during Oregon’s recent down-period. Con’s: Doesn’t play to his size and you’re often left wanting more. He’s good — but you’d love to see a little more punishment dished out. He’s the opposite of Kerryon Johnson who always seems to find a way to fall forward. Freeman isn’t the best cut-back runner and will fit some schemes better than others. Will need to work on his effectiveness in the passing game. Fit in Seattle: The Seahawks might be one of the teams who aren’t overly enamoured by Freeman. He isn’t going to help them set a tone up front and he isn’t a cut-back runner. He’s bigger than the backs they’ve drafted so far and might not be the most explosive tester (34 inch vertical at the Nike combine). Pro’s: Good size (5-11, 220lbs) and incredibly versatile. Exciting player. Penny runs hard but with control and skill. He’s shifty enough to make people miss and if you give him a lane he’ll capitalise. Highly productive kick returner. Showed his potential at the Senior Bowl by having a relatively quiet practise week and then went about making big plays in the game. Has shown patience in the backfield. Exceptional production. Con’s: It’s hard to imagine a middle ground with Penny. It feels like he’s either going to come into the league and be the next Kareem Hunt or he’s going to be overwhelmed. It’s hard to pick holes in his play but there’s something preventing you going all-in. Competition was weak in college and it shows on tape. Pass-pro needs serious work. Was a bit disappointing during the catching drills in Mobile which was a surprise. Fit in Seattle: He fits the size ideal. The combine is important. They like explosive athletes at running back. How he tests in the vertical and broad jumps could be the determining factor on whether he truly fits. Excellent overview as usual, Rob. Thanks. I can see the ‘Hawks drafting a RB early and assume they’ll get at least one more later. Like they did with Carson and Rawls, what are some names of backs they might go after in later rounds or as UDFA? LSU’s Darrel Williams might be one to keep an eye on and I know a lot of people like Jaylen Samuels. Darrell Williams looked good during the Senior Bowl. Some other guys I’m curious about, and wanted your take on them are: Josh Adams from Notre Dame (nobody seems to be talking about him), Kamryn Pettway from Auburn, and Kalen Ballage from ASU. Thanks. Interested in your take on Jordan Chunn? One of my favorite guys. I know working from spread formations, and in a weaker division is going to hurt his stock. But he played the same against big competition. Good on special teams, great one cut guy, and super physical. Also believe he will test well too. What do you think of Mark Walton from Miami? Seems like a tough runner and gritty in pass pro. We’ve seen Seattle emphasize a player’s tape when healthy and disregard a bad year filled w injuries (like Malik last year). Supposedly, Guice’s 2016 tape is far better than anything in 2017. Gotta wonder if Seattle has a Round 2 grade on his 2016 tape and a Round 3-4 grade on his 2017 tape. His drop in perceived value could be an opportunity for them to get good value at a good price, as Robe suggested. To me Guice is a funny prospect to judge. As a potential round one pick I’d shudder at the thought. As someone you might get in the late second or early third? It’s a run to the podium moment. He’s limited but he’ll give you at least four years of laying out for the team. I agree—I’ve now watched a lot of Guice’s tape and there are moments where he slaps a defender into the ground and you go, Wow. That’s what Seattle wants and needs. Then there are times where he wastes so much time with poor footwork. He’s very decisive in his cuts, but he looks slow in and out of breaks. It gives me flashbacks to Rawls dancing for -2 yards. So far, I’d say Guice and Tennessee’s John Kelly are the most “physical” backs I’ve watched tape on. The difference is Kelly’s value is much better than Guice’s. Your comment about Guice slapping a defender to the ground one play and then wasting time with poor footwork on another play reminds me too much of Rawls. I think you hit the nail on the head with your Rawls comparison, Rob, and I’ve thought the same thing. This is inherently what scares me about Guice. Would we be getting the good 2015 Rawls, or the bad 2016-2017 Rawls? You have to wonder if the similarities to Rawls results in a tepid interest from SEA. Ive looked at a lot of guys receiving stats and you dont see a lot of production from anyone. Seems like the screen game isnt that big in College Football. Ill bet a bunch of these guys will get much bigger receiving numbers once they enter the NFL. Looks like Georgia really didnt like to use the backs in the screen game. It seems like in college they just say why throw a screen pass when we can just hand the ball off. Rob, great article. Well done. Always appreciate your effort! Apologies for nit-picking but I didn’t see much in there about pass-blocking or blitz pickup aptitude, and I think that will be a factor in the Hawks’ decisions. I know it’s an underdeveloped trait for college RBs but could be useful information if we have any knowledge of their skills in that area. Any chance you can fire off a quick thought on each? The best pass blocker was Damian Harris but he didn’t declare. Kerryon’s isnt bad but he has some whiffs. The rest, not studied that much but I know Jones II, Chubb and Michel weren’t asked to do much. I know it’s wasteful to pine over what is not rather than focus on what is there… But ‘GAH!’ Harris going back to Bama was a gut shot. He was THE guy I wanted in the late-20s. Maybe we could coax Ricky Watters out of retirement to do nothing but. Another great artlicle Rob. It looks like these guys are roughly in order? Chubb and Jones look like studs to me. The rest of them are a bit of a muddle, IMO. Guice and Johnson are solid and safe. Penny and Michel have nice upside. I think Freeman would be an excellent excellent early down runner for our scheme, but Im not sure he has the mentality for our team. He’s that sports car that never wants to crash. I’m afraid that Kerryon Johnson is too built. Looks like a tear waiting to happen. Love that analogy for Freeman! Johnson is listed at 6′ 212lbs but he looks smaller. We really need to see the combine numbers. Great breakdown Rob! That’s why I love this site. So if there are eight quality RB’s in the first 75 picks or so, doesn’t that lessen the chance of SEA drafting one at #18? I think most agree SEA will trade down to get an extra pick(s). I’d love to see them grab a quality guard in the 2nd (Hernandez? Billy Price?) with their first pick then in the 3rd grab one of the RB’s you mentioned above. It depends really. If they like Ronald Jones II enough they could take him at 18. Although if they stay put it means they likely accumulated some stock on day two by other means. Seems like a solid trade down strategy. I’ve grown to like Penny and he may slip into the third round. Great break down as always. For all the talk about how great this running back class is the only guys I would be excited about the Hawks taking on the first 2 days are Barkley who will be a top 5 pick, Jones if we trade back into early second or Michel if we pick up a 2nd round pick via trade. If we can’t get one of those 3 I prefer to take a couple of RB on day #3 like Ballage, Kanyrn Pettaway or Daryl Williams. I just don’t see the rest a big upgrade over Carson, Prosise and perhaps a free agent like Hyde. I’m fascinated to see who Brian Schotty likes more: Chubb or Michel. Time will tell. Personally, I’m fascinated to see which big receiver Schottenheimer chooses, Hawks need a replacement for Graham and this is the draft. I’m hoping rob writes a piece on it soon. DJ Chark, Jaleel Scott, Steven Dunbar (can’t see if he has declared, new info would be nice), Auden Tate, Simmie Cobbs, tons of great prospects replace Grahams size. Great call. WR may be a position we target early. Losing Graham will certainly matter. Another factor is how much they rate Darboh. If they think he can step up, then it may not be addressed super early. I feel that they were dissapointed with Darboh because he was a route runner more than a go up and get it type of receiver. I liked what i saw from Darboh on the field has some crisp cuts in the open field on his routes. The Hawks offense is in a really good position for next season, this draft gives them an opportunity to address their 2 biggest needs while also adding some defensive players late. Simmie Cobbs looks like he has the right mentality for the Hawks! Look at the play at 1:30 thats toughness we never saw from Graham, heck the first catch of the video where he high pointed the ball was something we really only saw from Prich this year. I think Arden Tate is going to be a red zone TD machine in NFL. Unfortunately will likely be a top 50 pick. Do you know where DJ Chark is Projected to go? I wouldn’t mind spending a late second/early third on him. I’m starting to think theres less and less reason to stay at 18. The Hawks have more than one need that needs to be filled immediately on offense and an opportunity to address it. At first i thought they would focus on defensive speed early but honestly, Bruce Irvin is probably gonna be a free agent and I’d really like to see him back and i think he’d make a big difference. I’m sure that Schottenheimer’s opinion will count on these two, but I think most of the weight in evaluating them will come down to how Schneider and his scouts see them and the other backs perform on film. Would love to end up with one though, especially Chubb. Rob, have you seen Pauline’s mock draft that came out today? Has SEA going with Vita Vea at 18. I don’t know if Vea will be a generational player. But he’s a generational athlete. I saw it. I love Tony’s work but he’s seriously underestimated Edmunds there. There’s no question we’re gonna draft a RB. But the question is when we’re gonna draft one. Durability definitely plays a factor cause the last thing we need is another injury prone RB. PC and JS must be careful and smart with this pick. Daniel Jeremiah update to 50. Great description of Royce Freeman. I watch a lot of Oregon football and since he came on the scene he has always left you wanting more. He does not consistently get the tough yards either. I do love his production though and what he did for my team, but he needs to run harder and up to his size if he is going to be successful in the NFL. I believe he has the potential to do it, I just wouldn’t want him until the fourth round or so. Jay Ajayi is exactly who I thought of when I watched Penny. Very well-rounded bruiser that does a bit of everything, and has all the tools to be great. However, runs a tad upright and lacks a certain edge that would take him to the next level. Doesn’t seem to really excel in any one area. Wouldn’t mind grabbing an Ajayi though and replicating an Eagles backfield that just won a Bowl. This opinion comes from just watching a few YouTube videos. While Price looks to be a very competent, long term pro, Frank Ragnow out of Arkansas looks to be the better prospect, and the more impactful player. Don’t get me wrong, I’d be thrilled if we could swing it and get either guy. It’s just if I had to choose, I would choose Ragnow based on their play on the field. You made me sad, you mentioned Mo Morris… loved that guy. I’m thinking Seattle will look for someone different than what they have on the roster right now. Penny and the Ajayi comparison has me very intrigued now. D’ERNEST JOHNSON 5’10” / 208… has ability to punt or kick return. Set UCF record for most yards from scrimmage. I don’t know very much about him, but the ST ability intrigues me. I’m a hometown hero so I’ll be the first to post but for a late round or udfa rb; WSU Rb Gerard wicks? 6’0 & 220 lbs. pass pro isn’t horrible and can catch out of the backfield pretty well. He didn’t get a lot of touches last year with them having marrows ( who’s 5’8 and 190lbs) and Williams who is going to be a Jr next year and one I’d really watch for in the pac 12. Thoughts on Wicks and potential fit he has for the hawks? Washington’s running back Coleman will be available late. He is a good runner between the tackles. Rob, what’s your take on Lavon Coleman’s ability to compete in the NFL? He has a shot, worth a camp. Comparisons: Carson/Bell is a wide range. In the aspect of patience, I can see it. Guice – Rawls, spot on. Freeman – Howard, accurate. Chubb – Stewart, if also accurate (think so); would be worth a 25-50 pick. Penny rd#2 – This seems higher than any notion previously given(?). I like Rashaad but given his small school and the overall depth of the RB class; the grade is high to me. Cha- thanks for your earlier post. Pass blocking from the RB is under rated. Harris was my highest rated RB before he decided to stay and that had a lot to do with it. Agree about the Chubb/Stewart comparison. Stewart was a seriously good prospect, and if not for injuries would have been a bigger star in this league. Even in his “older” days, he was a valuable. In 2015, he was the guy that kept the chains moving in Carolina. He turned nothing into 4 and 5 yard gains. That’s a valuable skill. I remember J-Stew’s draft year because he was the guy I wanted SEA to end up with and I thought there would possibly be a chance with his injury. Not even close. On a running the ball tangent, the above was Doug Baldwin’s reaction to the SB. More rushing yards should help with third down. We had some many third and longs it was impossible at times to get first downs. I know Seattle has a history of not trading up in high rounds and often trading back. I am curious however, on your thoughts of a possible trade up this year if they have Barkley as no.1 on their big board. Since Pete Carroll emphasised the importance of fixing the run game this year, and Barkley seems like a generational talent, do you see any possibility of Seattle making a move if he falls to Cleveland at 4 or lower? If there’s any chance to get Barkley you take it — but it’s highly unlikely given Seattle’s imminent rebuild and lack of stock. With running backs you have to look for two variables: Quickness and yards after contact. If a prospect lacks both traits then he’ll probably be a disappointment if drafted high, while lower drafted backs who have those characteristics are big favorite to surprise. Every scouting report on Jay Ajayi, for example, spotlighted quickness and yards after contact. This is another example of a systematic approach superior to tired flawed subjectivity. Granted, it was subjectivity that provided those two traits among the positives. But if you use a pure tape approach without understanding how much weight to apply here and there, then the time and effort is mostly wasted. With respect Awsi, I have absolutely no idea what point you’re trying to make there. A systematic, weighted approach is the ideal – but there are other approaches that have value for those that can’t make a full time job of it. We all have eyes to make reasonable judgements with. That being said, I love Matt Waldman’s writing in the value of a rigorous weighted evaluation system. On your other point, for me footwork (including footspeed, which is closely related to quickness) is the critical trait. Other things matter a lot obviously, but quick and balanced feet are hugely important. I always thought that was Lynch’s best attribute, and wasn’t talked about enough. Marshawn’s lateral quickness was unreal. I’ve said in the past, that the ideal RB I want SEA to draft has that first and foremost. Acceleration (not necessarily top speed) is what I would look for second. That allows you to break through the arm tackles at the line. Just my two cents, not sure which back fits that bill best. I was against the Lacy signing from the beginning due to the fact that he had neither of those qualities. Some were comparing him to Lynch, but I always saw him more as Marion Barber and that was even probably generous. Lacy has good power, but it takes him forever to accelerate and he has little lateral quickness. I want a back that can avoid contact in the backfield with quickness if needed and then burst through the hole. Jones fits that bill. Phenomenal balance, coordination, foot speed, and lateral movement. He runs through arm tackles. His size can be a factor if for some reason his feet get stopped. But that’s pretty rare, as he does a great job of keeping his feet moving, enabling him to drive forward even at 200 lbs. There is plenty of footage showing him avoid contact in the backfield or in the hole, then bursting up field with great acceleration. I agree with that assessment and that’s why Michel is special. He stops, starts, skips, slides, jump-cuts, deadlegs, all while moving exceptionally quick. It looks like a patient Rawls, but with way better vision and unnatural lower body strength. I’m all abord the Michel hype-train. You’re missing the forest for the leaves. Pine cones even. If you can get Ronald Jones, Austin corbett, Durham Smythe and a late pick on Kalen balage. I think that alone would be pretty solid draft for the offense. More talent at RB and guard is key for all we know Odi or Fant might be that mauling LG and Chris Carson might be our franchise back but you shouldn’t bet on it. Ballage was inconsistent and physically doesn’t fit SEA’s RB profile. If they deviate from that profile I’d prefer Wadley. But I doubt they’d take either. I’m looking at Jarvion Franklin. 5’11” 225lbs. Good production between the tackles. Not a home run hitter, but quick in his cuts, with vision/patience. It will be interesting to see how he tests. Could be had in R7 or UDFA. Jarvion is probably the best RB no-one is talking about. Had a serious fumbling issue his first year that he cleaned other than that he doesn’t have any fatal flaws in what appears to be a well rounded game. He’s been a consistent rushing and receiving option at Western Michigan throughout his career. I see a starting NFL RB similar to Alfred Morris not likely to be star but will be a consistent contributor on a very cheap contract for 4 years. He has shown an ability to carry the load and will give the team an opportunity to have a consistent running game even if guys like Carson or Prosise are unavailable. High floor low ceiling prospect and probably a better long term option than Carson IMO. What is Seattle’s RB size profile? It looks like there isn’t one. At one end is J.D McKissic 5-10,195 (Wadley Size) to C.J. Prosise 6-1, 225 (Ballage size). Carson at 5-11 215, in between them. And then there is Lacey, who knows how much he really weighs. Depending on what you look at, Carson could be 6’1″. Generally, the SEA RB size profile is 5’10” 220 lbs, give or take an inch and 5 lbs. Lynch, Ware, C-Mike, Turbin all fit within those constraints. I doubt it’s a hard and fast rule, but that’s the size they generally have looked for. Jones and Smythe are my draft crushes so far – if we got both I’ll be doing back flips. I think you’ll need to get into the 3rd to draft Smythe though. And Jones could be gone even before 18. Personally, I’ll pass on Balage, unless you can get him late. Good job Rob, I like the way you have them ranked. I also like the idea of looking at some mid to late round options for the Seahawks. Unless you are in the draft meetings, it’s hard to know which way they could draft this year. Fix the run game with RB early? O-line early? Maybe even DE or LB early. I’m not sure the coaching staff has given up on Carson or Rawls for that matter (showed flashes of his old self while coming back from injury). They may not count on them but they may just be looking for healthy acceptable insurance at the position. If that’s the case, I can see them looking at someone like Bo Scarbrough. Big, strong, hard to bring down type of back that can run over tacklers. Although he wasn’t the feature back at Alabama, some scouts think he could be an every down back at the NFL level. Comes from a good program and is getting better at receiving out of the backfield. Rob, are there some later round selections that you could see fitting into the Seahawk’s game? I think the options tail off a bit later on. Darrel Williams at LSU is worth a flier I think but strictly a flier. I’m not convinced you’ll find a Carson type. Maybe. But it’d be best to tap into this group. Do you think that it would be worth investing a significant amount of this draft’s limited resources in a RB? A top RB in rounds 1-2 just seems like a luxury that this team can’t afford right now. I’d rather just get a bunch of cheap and desperate UDFAs to run hard and give 110%. If both Paul Richardson and Jimmy Graham walk, that’s 17 touchdowns that will walk out the door. Who are we going to replace that production with at receiver? The only way I can really get behind drafting a RB early is if we trade Earl Thomas for a second first rounder or if the Browns send us 33 and 35 for him. That would signify that they’re really going to build around Russell and get back to more of a balanced team, instead of investing so much cap in aging players that don’t want to be here anymore. I don’t think it’d be a luxury. The running game is an absolute mess. They need some of the WR production (touchdowns) to go to the RB’s (only ONE touchdown in 2017). It’s crucial they improve that position. Plus, at their peak in 2013 and 2014, Seattle’s targets were Baldwin (UDFA), Kearse (UDFA), Willson (R5) etc etc. So I think they can make up some of that production with a strong running game, which they had in 2013-14. Furthermore, RB is the strength of the draft. I fully understand that its the strength of the draft, but do we really need a bellcow? Do we really need 1,300 yards and 10 TDs from the RB position? I mean, that’s all well and great… but if we could get ~800 yards and ~6 TDs from a lesser RB, and use that first round pick to lock down an edge rusher, or a big weapon at WR/TE to replace the connection that Russell had with Jimmy, or the heir replacement to KJ Wright, or a potential replacement for Richard Sherman… or better yet, trade back and get 2-3 of players who could fill those roles…I just think that’s a better use of our limited resources. RB still seems like a luxury. It would bring some excitement, but perhaps Mike Solari and Chad Morton can fix Rawls or maybe Prosise can stay healthy in his 3rd year like Richardson did. Even bouyed by Wilson’s rushing stats, Seattle’s run game was abysmal last season. I’d like to see at least 2000 yards and 10+ TDs from the run game next season. That’s 125 yards per game, which would be solid. If we say that Wilson is good for ~500 yards rushing, that leaves ~1500 yards for the RBs. They need to add a couple guys at the position better than they’ve had to ensure they are able to get there. Eyeballing it I’d say half of Graham’s TD were of the ‘quick pass inside the 3 yard line box out the defender’ variety, which should be easily replaced by having even a middling running game. Lockett should rebound and make up for Richardson. He had a serious injury and the year after he should regain some explosiveness. Baldwin can increase his numbers too. He’s proven he can handle top corners. The balance should be made up between Darboh, Moore, and Draft Pick at TE/WR. Maybe McKissic and Willson if they come back. A lot of those 17 touchdowns should ideally go to the running backs. Lets assume the Hawks dont address the OL in free agency and they trade back to acquire a late second rounder, which two positions do you want? Looking at the flaws of the top RBs (Barkley excluded) it is hard to get excited about having any of them in the 2nd round. Pretty much all of them play small roles in the passing game and at the same time have issues in pass protection so don’t really offer much value on 3rd down. The very best between the tackles runners are injury risks, and will also be limited by the quality of the offense line they are playing behind. With the Seahawks O-line play being as bad as it is I think it’s too early to be spending high picks on dependent positions – especially ones that aren’t complete players. I honestly don’t seem a significant difference between those top RB. All will likely need to be paired with another guy to maximize the production from the RB position on the team that drafts them. I’d be looking from more than that out of a second round pick which is probably why I’m so down on this class. Kareem Hunt was clearly the best overall back leading up to last years draft. He had the production, ball security, pass catching ability, balance and quickness that wasn’t apparent in the anyone in this or last years draft. He also showed he could carry the load and avoid recurrent injuries. There just isn’t a RB that is as good as him in this draft IMO and I don’t really think it’s close. Hard pass on a RB in the first 2 rounds. They have a lack of talent along the O-line that really needs to be addressed and their D-line just doesn’t have the young pass-rushing talent necessary to be a great unit moving forward. Agreed. I’d take Option 2 every day of the week. Either order. You don’t think any of the non-Barkley running backs compare to Kamara? Wow that is a hot take. Hard to say what the talent level is on the OL until the new coaches work with them. They all looked too defensive and confused on who to block with Tom Cables system. Our entire starting line last year was first and second rounders so the talent was certainly there. Their confidence seems to have been completely shot by the circus show that was the Cable system though. I personally think we’ve invested enough resources on the line already. Maybe draft one or two more guys but the most of the tools are there already, it’s just up to Solari to build with them. Meanwhile at RB, talent-wise we have almost nothing but low rounders and UDFAs. Our highest drafted guys, Lacy(2nd round) and Prosise(3rd round) are very unlikely to see the field in a hawks uni again. The cupboard seems pretty bare there so it’s time to restock. Guys like Luke Joeckal aren’t really 1st round guards He was a LT and always played left tackle. That’s where he was projected as having a first round level of skill. If he had NFL level athleticism for the position he probably works out as at least an average LT. His main tape at guard was in Jacksonville. Tape that wouldn’t put in the first round. Ifedi is probably the guy most in need of a change in coaching his biggest weaknesses are really inconsistency in technique and mental errors. When he gets those things right he looks like an above average starter. Improvement along the Oline also improves the redzone offense more than any RB might. They have been consistently bad in that regard even with Marshawn Lynch. They definitely need to add talent at RB. I suspect at least two of those guys will fall in to the 3rd round and should be the Seahawks targets. Where you drafted them is not the indicator of what they are or how much talent they have. Carpenter was a first rounder. Would anyone spend a 1st round pick on him after seeing him perform in the NFL? Luke Joeckel was the second pick in the draft. Would anyone spend a first round pick on that guy? So now the question is were we wrong in our evaluations of our line talent? Or was it coaching? We’re about to find out. Mark and Leosharp you both bring up a valid points, but I think we might be defining ‘talent’ differently. I’m talking talent more as a ‘potential’ or ‘ceiling’ or natural athletic ability. Players wouldn’t get drafted high if coaches don’t see that in a player. I think our O-linemen all have a high ceiling, but for one reason or another have not been able to reach that ceiling. As I understand it, I think you guys are talking about something closer to ‘skill’ or ‘production’ which is easier to judge with actual results and data. That is something that’s hard to predict though, as many factors go into that such as scheme fit, injury-luck, motivation and such. Joeckal and Carpenter both had high ceilings but never reached them due to factors like injuries, work-ethic, and such. So to me those guys have ‘talent’ they just don’t have good results and production. So my point is that we have guys with high untapped ceilings on offensive line. They can be made to produce results with better coaching. Meanwhile we don’t have very high ceilings on our RB squad. Carson is a big maybe, McKissic is a gadget guy, Mike Davis seems to be just a guy, Prosise had a high ceiling but is made of glass, and Lacy is donezo. I think that’s a sign we should look for some higher ceilings there. I very much agree. The Oline has a lot of ceiling left to reach and the RBs are probably already bumping against theirs. Generally I believe the first 3 rounds should be biased towards high ceiling prospects. There are very few ways to objectively measure that but guys like James Cobern have been able to create production analytics for the RB position. are the only RBs in the draft with elite upside then the pool shrinks significantly. Barkley isn’t in play, Chubb hasn’t shown that level of talent since his injury, their are concerns about Guice’s athleticism and Penny went against weaker competition. According to Football Outsiders the Seahawks running game was consistently attributed more to the O-line than it was to their RBs breaking long runs for there to be success in the running game. They were both highly rated during Lynch’s peak years but the line always rated higher. This all changed when Russell Okung and JR Sweezy left after the 2015 season. Over the last 2 seasons the RB’s breaking of long runs has been significantly more important to running back success. Their percentage of runs stopped at or behind the line of scrimmage also plummeted they ranked last in 2017. I think that is mainly due to the guard play where they have seen a significant drop off from Sweezy to Pocic who has never shown the makings of a dominant run blocker. Additionally Brown is probably a slight downgrade from Okung as a run blocker. The Seahawks must add a guy who can run block if they expect to see significant improvements. Ifedi could move back inside but the way he has performed with such glaring technique flaws makes me think he has a lot more to show as a tackle. There are so many ways in which the O-line can be improved but improvements at RB appear limited. This simply isn’t true. I think you’re trying too hard now Leo. That is true but the unit was historically bad in the running game. They need at least one guy maybe two pus significant improvement from guys like Pocic and Ifedi before this is an above average unit. If that was the case Hunt wouldn’t have lasted until the 3rd round. The NFL has consistently shown an inability to accurately value talent the draft. GMs are generally bad at extracting value from the draft with only a select few working the board in their favour. For example Shaquill Griffin at the end of the 3rd over Kevin King at the top of the second. Based on production analytics and athleticism traits there wasn’t nearly two rounds of difference in their upside. I don’t even think the tape showed that much difference between the two players especially when you look at the value of those specific pick based on various NFL draft trade value charts. – Not an asset in the passing game or particularly explosive. limited as an outside runner and doesn’t have the athleticism to create yards for himself. – Not a 3-down workhouse running back. Best used in a committee as a change of pace and in space. Explosive skill set but shouldn’t be relied on as the lead back. Kareem Hunt was from a smaller school and at first glance doesn’t look to be an elite athlete. The athleticism traits necessary to be successful in the NFL at pretty much all positions is overrated but none more so than at WR and RB. FWIW NFL.com states his explosiveness is a weakness despite objectively being more explosive for his size than the first 3 RBs in the draft. Hunt just didn’t have key flaws to his overall profile coming into the NFL. If all else was the same and his school was Alabama he probably goes in the 1st simply due to SEC bias. Just look at how Damien Harris is billed. No history of being a workhorse, Not a significant factor in the passing game but is looked at significantly better than Hunt. Unless he catches 30 something balls and is a true solo rushing threat (which might happen with Scarborough leaving and a move to a new QB) he won’t have shown in college the complete game that was Kareem Hunt. So no consideration here for the fact Hunt was able to walk into a very settled, productive, explosive offense with a competent QB and Fournette had Blake Bortles? It’s possible to manipulate any argument to suit a stance. There’s really no need to diminish the other guys and make out Hunt was an obvious success in waiting. Occasionally the team you land with dictates your ability to play to your best. Blake Bortles is very very bad. but you can remove partially remove him from the equation when you compare Fournette to the lead backs in similar situations. IMO Fournette was the most overrated RB in the draft and is just as overrated as a pro. The team he is on does impact success but as a runner Fournette just about scrapes into the top 25% for total value and isn’t even in the top 33% for efficiency. I am reluctant to say it’s the situation he is in when guys like Jordan Howard, Isaiah Crowell and Orleans Darkwa are able to produce in a similar fashion. He had at least average blocking but was unable to leverage that into significantly more yards. As a O-ines the Chiefs and the Jaguars were very similar in terms of blocking however Chiefs gained more yards from their RBs than the Jaguars gained from theirs. Kareem Hunt was in a very good situation but he consistently maximized those opportunities which is something Fournette wasn’t able to do as well. I don’t think Fournette steps in and looks better than Hunt did as a Chief and he still wouldn’t have the receiving ability. My stance on the RBs was made long before they ever played in the NFL. The analytics and tape study both supported Hunt having the most rounded game. That has just carried through to the NFL. Hunt wasn’t a guaranteed success but his profile definitely said he had that sort of upside. There is inherent bias due to my position but I believe my comparison of these players is supported by the evidence available. I disagree strongly with your take on Fournette. I think JS will trade back to pick up a 3rd. If he does which option do you prefer? Option #1 for me all day. Love Jones at RB but Wynn helps both run blocking and pass pro. Penney would compliment Carson, Davis and Prosise. I think they go with front seven. They’ve gotta start investing in that line, especially with Malik, Cliff, and Bennet’s futures up in the air. Imagine Option #3: Key/Landry (DE) and Penny (RB). Its the magic question if free agency doesnt fill one of the three holes. Which two do you go for if you can only get two? To answer your question Trevor I would go #1 as well. I keep coming back to the same two players – Wynn and RJ2. Would that we could get both and transform the run game, and by extension, the entire offense. But both (probably) will go somewhere in the 25-35 range, so absent a major trade, that’s just not realistic to have two picks that early. I’m not all that enamored of Penney. I respect his production, and I think he can be an effective CoP/OW type player in the pros. I don’t think he’s a lead back in the NFL. Maybe that’s not as big of a deal with Carson on the roster. But if you aren’t drafting for a lead back then you shouldn’t use your first selection on that position. To me, RJ2 is capable of being a lead back (20+ carries a game), and he’d be a tremendous compliment to Carson. Just spitballin’ here but I think I’d rather have Wynn/Chubb than RJ2/Corbett, if there’s any way Chubb slides that far. I dont know about RJ2 getting 20 carries, might kill him. Maybe 15-17 touches a game? Ill spitball all day with you as its all opinionated anyway. I think RJ2’s floor depends on what happens with Bell @ PIT. If they don’t resign him I think that’s the farthest Jones slides. If they do resign him, I don’t think Jones gets past NEP. Can you imagine the Patriots with Jones? Jeezus! Wynn is harder to peg where he’ll go. Plus there’s some competition with Price and Ragnow (I think they’re all of similar talent). Can’t imagine he falls past NYG at the top of R2 though. It’s possible BUF takes RJ2 with one of their R1 picks, or even CAR. I know they drafted a RB last year but McCaffrey wasn’t everything they’d hoped (yet?) and Stewart is in the last year of his contract and over 30. They’ve also “double-dipped” at specific positions before. I think Jones should be a top 15 pick based on talent, but most national draft guys have him in the 2nd round. It will be interesting to see if that shifts as we get closer. If we could trade down and pick Jones in the 30s I would freak out. I think NE has had so much success with lower cost backs that they will go defense early. They haven’t had as much success developing guys on that side of the ball, and just lost their coordinator. Jones has been under the radar all season. Darnold took most of the attention. Until a few of weeks ago I thought Jones would go in the 35-50 range, so if SEA wanted him, they could pull a repeat of what they did last year — two modest trades down for an extra R3 and R4 (or one larger trade for the same) — and still get Jones. But after reading Rob’s article with the Charles comp, and the discussion in the comments, plus I sensed a shift in awareness of him at the national level…now I’m not so sure. If Jones weighed 15-20lbs more I wouldn’t have the slightest compunction about taking him at 18. And neither would the rest of the League. But in the same way that Russell Wilson was “too short” to be a great QB, I think Jones is “too light” to be a great RB. In other words, it really doesn’t mean anything. He’ll slide because of his size, and some team is going to be grateful he did. Is positional cost/value a draft consideration? When league average OG play costs as much/more than all RBs not named Bell, do you draft Price/Wynn for value instead of Jones II for need? Same can be said for front 7 cost/value. Why not draft $50 million in OG production instead of $25 million in RB production. IMO, unless you’re replacing high priced positions with rookie contracts, you’re inevitably going to need to address those positions in FA (Joeckel, Aboushi) or trade (Brown) and inevitably be in cap and draft hell…like we currently are. Since we may be replacing Brown and Clark sooner rather than later, would draft OG/Edge before RB. Further, would rather sign a Hyde at $4-5 million than a Joeckel at $8 million. Hope my question and take were clear…doubtful. I would not disagree but I’d say it comes down to the system the Hawks have used. How much more value is Draft Pick at that position than the players on the current roster? For example, if the Hawks think say Wynn is only a middling upgrade from Odhiambo (and may factor that Wynn would need more system & offseason work whereas Odhiambo is ready to play now), but a Jones is a healthy upgrade over the Lacy/Rawls spot and can take those snaps from Week One, they could easily justify taking the “lower-salaried position” player. Agree, but would add it’s what they have or could acquire in FA or through trade. In short, cost of positional upgrade. Therefore, IMO, they could upgrade RB in FA or through trade cheaper than upgrading OL in FA or through trade. In short, better value drafting OL and/or edge than RB. If they judge their current OL as trash and cost in FA/trade is so high, I would take 5 years of Price/Wynn production, 24/7. That said, if Jones II is there at #18, would be a dilemma. Positional value is absolutely a part of the draft process. That’s why Kickers/Punters are not generally drafted before round 4, unless you’re Oakland or Tampa Bay. I’d say the team’s time frame is an important part of it as well. Generally speaking, a RB will produce more in his rookie contract than an OL will, and his value/skills diminish faster. OL’s are going in the opposite direction. So do you want to win now? Go RB. Building for the next 3-4 seasons? OL. I’m with you, for the most part, on the importance of an RB, and I do believe that Seattle should address that early. If the value is there for RB’s over OL’s, then go with the RB, but don’t reach out of desperation. Off topic but I was reading some recruiting stories and came across the brother of one such kid, who just declared for the draft. His name is Equanimeous St Brown from Notre Dame. The family seemed interesting so I looked him up. VERY interesting kid. 6’5”, 203. Big, long target obviously. Played well but screams of a guy that will be a better Pro than college player. He is also pretty fast (and not just for his size). Comes from a pretty eccentric family so has some personality. Haven’t seen his name on here when people mention bigger WR targets. Could be a nice get day 2/3. Interesting player, I couldn’t find a highlight of him going up high and fighting for a contested catch. That seems to be where college WR’s fail in the NFL. Very long and skinny……. hope he doesn’t get broken in the Grown Man’s League. Maybe its just his legs that gives me that impression, they look crazy long. Yeah that’s the one I was reading about. Haha. The whole family sounds like a handful! There are only so many slots in the league open for any one position. There have been exactly 6, 7, or 8 RBs drafted across the entire first three rounds in 8 of the past 9 years [there were only 4 in 2016], and no more than 5 in rounds 1-2 since 2010. This would be the year to get up a notch or two on those thresholds but the sheer numbers game is still bound to push some guys down to late day 2 or even early day 3, especially if backs like Love or Ballage pop into the Day 2 mix as well. If one views as a tier all the backs backs ranked 2-X (for whatever value of X), it seems far wiser to be the team who drafts the Xth back rather than the 2nd. There’s no limit on the number of players per round per position. Don’t handcuff yourself with this kind of exercise. The players have to be viewed from an individual lens. Was looking at the free agent DEs to hedge against our potential losses. Anyone have an opinion on CIN DE Chris Smith? Coming off of career highs GP:16, Tackles:26, Sacks: 3, FF: 1. He is 26 years old. 6’1″/265lb with 34 1/8″ arms, 10-split: 1.59s, Vertical: 37″, Broad: 121″. Was imagining a scenario where we let S.Richardson walk, trade back to target Tim Settle, and hedge DE with a lower cost FA. Second pick is RB. Only 26 tackles in 16 games? He sounds like The Invisible Man – your only proof he’s there is a paycheck stub. Rotational player backing up Carlos Dunlap and Michael Johnson. Big stats and big names come with a big price tag. A Lawrence or Ansah type are going to get astronomical APYs. Wow compared to Ansah’s 40 wow. Its a question im really been struggling with. It seems like, for the first time in a while, we might be in a position to get a lineman, in Price or Wynn, thats ready to go from day one. And with probowl potential to boot. I think we know how that would help us. I’d rather trade a marquee player to get a second and/or third round pick so we can get both a great interior o lineman and a great running back. Or I’d trade down. If I were JS and PC I’d only draft a guy at 18 that’s a top 7-10 guy on their board and has fallen to 18. To answer my own questions before i accidentally pressed submit. I think running back would make a bigger difference but the talent drop off from Price/Wynn to, for example, Corbett is greater than that of, say, RoJo to a Freeman or Penny. I did this longwinded bold prediction last year around this time, predicting roster moves, free agency, draft and the season. I got Tedric Thompson in the mid rounds right! Thought I’d give it another go. There following does not reflect what I wish the team does, but more a reflection on what I think they will do over these weeks and months. Hot take: They draft a running back! MY BOLD HOT TAKE SEAHAWKS PREDICTION FOR 2018. As the weeks have past after Seattle played its last game, the tea leaves have started to show signs of heavy change not felt since the 2010 season. 1. The players that they feel great about on the defense are Frank Clark, Jarran Reed, Nazair Jones, Shaquille Griffin, Justin Coleman, and Dion Jordan. They think they might has something with Malik McDowell, Delano Hill, and Tedric Thompson. 2. Offensively, they like Tyler Lockett, Chris Carson, Nick Vannett, Germaine Ifedi, and Ethan Pocic. They are also optimistic with Amara Darboh, and still somewhat so with CJ Prosise. 3. They determine that the older cornerstone veterans they feel good about building around are Russell Wilson, Doug Baldwin, Bobby Wagner, and KJ Wright. Kam Chancellor retires and the team reaches a compensation settlement giving the team “some” cap relief. Richard Sherman, Jeremy Lane, and Jon Ryan are cut. Earl Thomas is traded to Dallas for their 2018 R2P50 and R3P81 picks, and defensive lineman Tyrone Crawford, who Dallas will need to part ways with to fit Thomas’s new deal under their cap. Crawford’s deal as a potential out in 2019. Seattle finds a trade partner with New England for Michael Bennett for their R6 pick. They reach new contract deals with Bradley McDougald, Byron Maxwell, Terence Garvin, Marcus Smith, and DeShawn Shead who will compete with Delano Hill at SS. They tender contracts to CB Justin Coleman, DE Dion Jordan, RB Mike Davis, DT Quinton Jefferson, LB Paul Dawson, LB Dewey McDonald, and C Joey Hunt. Seattle will have picks in all seven rounds. With all the freed up cap, instead of making a couple splash signings, Seattle reaches a modest to moderate short term “prove it” deals with a number of free agents in the 25 to 27 Yr Old Club with starting experience and maybe something left in their ceilings, a la Dion Jordan. At R1 Pick 18 Seattle finds a trade partner with Atlanta, who wants to get ahead of Dallas and Detroit when a talented DT is still on the board. Seattle receives picks 27 and picks 90 for pick 18, which actually works out pretty fairly on the NFL Draft Pick Value Calculator (I invite you all to try). 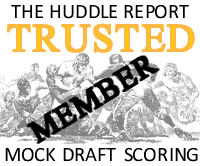 At R1 Pick 27 John Schneider gets a call from his buddy in Cleveland John Dorsey, who wants to move up for WR Courtney Sutton to complete his offensive trifecta of Saquon Barkley, and Josh Allen picked 1 and 5, respectively. Seattle receives picks 33 and 103 for pick 26. At R2P33, the Seattle Seahawks select Nick Chubb, running back, Georgia. At R2P50, the Seattle Seahawks select Austin Corbett, offensive guard, Nevada. Pete Carroll said that between Odhiambo, Su’a-Filo and Roos, they liked their competition at LG. Hogwash. They were looking at Corbett the whole time. At R3P81, the Seattle Seahawks select Breeland Speaks, Defensive End, Ole Miss. Seattle is look someone to compete for Bennett’s old gig. They have Dion Jordan, Malik McDowell as intriguing candidates, but can they trust Jordan to stay healthy and do they know McDowell can realistically come back and play? Breeland has good size and speed to play inside/out, and was a productive player for Ole Miss. At R3P90, the Seattle Seahawks Select Uchenna Nwosu, linebacker, USC. Seattle misses out on Darius Leonard, but Ken Norton Jr will be happy about this one. The former safety convert is an punishing tackler, and a physical enough to set the edge. At the Senior Bowl, Tony Pauline observed the Nwosu looks to fit the 4-3 scheme better than a 3-4. If Seattle wants to bring back intimidation and toughness, this probably isn’t a bad pick. Seattle trades back into R3 dealing R4P101 and R5P171 to New England for R3P96. At R3P96, the Seattle Seahawks select Javon Wims, WR, Georgia. Lockett is going into his free agent year. Darboh and David Moore are unknowns. Cody Latimer is a hedge. Seattle gets a physical receiver with upside. At R4P118, the Seattle Seahawks select Nathan Shepherd, DT Fort Hays State. Seattle feels like they got a gem here. Schneider will say that they had a day two grade on him. What Seattle gets is another active athletic DT in the mold of other DTs they have draft in the past. Seattle feels that Jones and Reed will start, but Shepherd will definitely factor in the rotation. At R4P120 the Seattle Seahawks Select Dalton Shultz, tight end, Stanford. Seattle gets a blocking tight end who can catch, just not the one from Notre Dame. At R5P143, the Seattle Seahawks select Kevin Toliver II, cornerback, LSU. Seattle lands a long physical cornerback they feel fits their press corner system as opposed to the off man coverage he played in at LSU. Chubb is the meat and potatoes they envision with their recommitment to the run game. Wadley adds playmaker potential. The Thunder and Lightening thing gets attached to them. Turay is raw, but freaky athletic. Clint Hurtt thinks he has clay with legit upside to work with in molding him into a third down rusher specialist. At R7P227, the Seattle Seahawks select Nic Shimonek, quarterback, Texas Tech. Seattle selects the second QB taken in the PC/JC era. Schotty thinks there’s something to mold there, and the new philosophy is to have someone behind RW who can push him. Seattle takes a late round flyer on the former Husky. Undrafted Rookie Free Agents include: QB JT Barrett, WR Tavares Martin, TE Cam Serigne, DT Bruce Hector, Safety Tyree Robinson, CB Deatrick Nicols and FB/RB Ryan Nall. LB: Bobby Wagner, KJ Wright, Uchenna Nwuso, Terence Garvin, Paul Dawson, DJ Alexander. CB: Shaq Griffin, Justin Coleman, Byron Maxwell, Kevin Toliver, DeAndre Elliot, Mike Tyson. Deshawn Shead converts back to safety. JD McKissic converts back to WR. Seattle’s DL features 3 big DTs in Jones, Reed, and Stewart, with Crawford specializing as the pass rushing DT. Breeland Speaks also plays NASCAR DT. Frank Clark, Dion Jordan, and Marcus Smith are the prime edge rushers. Malik McDowell starts the season on the PUP, but is activated midseason. Free agent signings Jay Bromley, Xavier Su’a-Filo, Troy Niklas and Alfred Blue do not make the final 53. Seattle reaches extensions with Dwayne Brown, Tyler Lockett, and Frank Clark, but the huge deal around the corner is RW’s third contract in 2019. The San Francisco 49ers emerge as the new class of the division, having splurged big time in free agency signing Le’Veon Bell, Allen Robinson, Dontari Poe, and then drafted Marcus Davenport. On a relatively easy schedule, they cruise to a 12-4 season. The Seattle Seahawks quietly have a bounce back season, when hardly anyone is talking about them until around December. The defense returns to the top 10 rankings, but the real story of this team is that the offense now boasts a top 5 running attack, and Wilson is a league leader in passing efficiency. Seattle ends their season 11-5 and earn a wildcard birth. The Los Angeles Rams come back to Earth in 2018. Tougher schedule, Aaron Donald’s contract eats up a ton of cap space, and they lose key defenders from the 2017 squad. Jared Goff has been figured out a bit more, and the easy throws don’t come near as easily. The team slips to a 9-7 season missing the playoffs. The Arizona Cardinals, with Sam Bradford at QB before Mason Rudolph takes over, manage a 8-8 record in Steve Wilks first year coaching. The division on the whole feels much tougher, as no team ends up with a losing record. The Seattle Seahawks upset the Carolina Panthers in Carolina, and Cam Newton has an epic post game melt down during his presser. Frank Clark, Naz Jones, and Dion Jordan beat the snot out of him. The Seattle Seahawks steam roll the San Francisco 49ers, knocking Jimmy G out of the game, and then feasting on CJ Beathard. Malik McDowell has 4 sacks in a coming out party. Seattle losses a tough fought battle in Atlanta, it came down to a 38 yard field goal in the end to put it into OT, and Carlson shanked it. In the post season presser, Pete Carroll is asked if he’s thinking more about retirement. He responds, “Heck no. We’re just getting started here.” He goes on to say that Russ had a really nice year taking to the new scheme, they feel great about the run game now, really liked how the defense played, feel that could add some more at cornerback, maybe safety, and they will always look to add pass rushers. That is a blueprint. Cool / thanks. Thats a great read! I dont agree with it all but I for sure love the thought put into it. you have way, way too much time on your hands. I have an incredibly patient wife who tries not to judge. Wow C-Dog, you’re on Fire! I hope they don’t cut Richard Sherman however, I think he can be great for years to come! Great work on this. I will be utterly shocked and disappointed if the cut Sherm. Pete was asked about Griffin at the end of the season and went on to talk about how much of an example Sherman had been and how he rededicated himself to his technique. I think the whole trade situation from last offseason cleared the air with Sherman and he had his best season on and off the field since 2014. I think Pete values him, I think he’ll age well, and I think he gets extended. Personally, I hope you are right. I would love to see Sherman stick around. For the record, I also really want them to hang onto Bennett for one more season, and find a way to extend Earl that doesn’t hamper the team. C-Dog…to call that a mock draft would be like saying War And Peace was just another war story. Truly an epic read. Really loved bringing in Akum Wadley and smuggling J. D. McKissic into the WR room! Also your vision for the D Line. Really enjoyed this thanks C-Dog! According to Tony Pauline, Bill Belicheck could be out as HC of the Pats very soon with McDaniels taking over. Has the day finally arrived that the evil Empire is starting to collapse??? Just done a new podcast with Kenny that will be up soon. Also been invited on two other podcasts this week so stay tuned. Also will be posting a mock draft with LOTS of trades in R1. Rad. Thank you for making the offseason so much fun Rob.